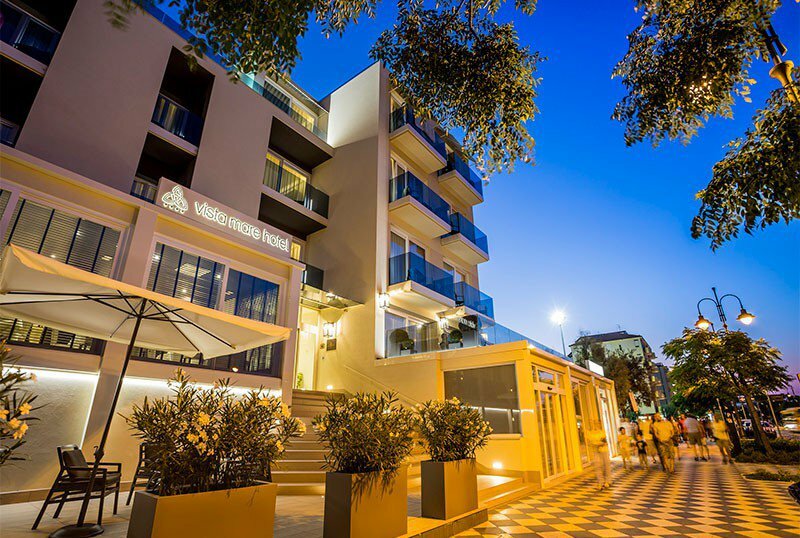 The Hotel Vista Mare & Spa is a 4-star hotel in Cesenatico open all year. Elegant and refined, it is located on the seafront right in front of the beach and features a wellness center, free parking, disabled facilities and a conference room. Admits pets of all sizes. The property is located on the Carducci seaside promenade of Villamarina di Cesenatico, right in front of the beach. Nearby, the large park of Levante with walking and cycling routes, pond and games for children. All rooms are elegant and equipped with natural wood filtering dividers, LED lighting, panoramic balcony, private bathroom with shower, air conditioning, safe, telephone, satellite TV 36 "with Sky channels, minibar, hairdryer, cosmetic mirror, drying rack, WI-FI, soft Spa Kit with bathrobe, sauna towel and slippers. MAGNIFICENT: features a panoramic balcony facing the sea, disabled facilities and a king-size bed. SPLENDIDA: free of architectural barriers with balcony facing the sea. LIGHT SUITE: rooms embellished with panoramic terraces and with welcome prosecco, fresh fruit, slippers and minibar stocked daily. Open-air porch, bikes available, panoramic terrace with Jacuzzi and lounge bar, 24-hour reception, wellness center, gym, TV room, reading room, conference room (32 seats) equipped with video projector and whiteboard, airport shuttle service and station, lift, beach towel available, theme nights, laundry service. Equipped for cyclists, it has a secure bike deposit. PARKING: uncovered and free, available for all guests. AIR CONDITIONING: present in the common areas and in the rooms. CONVENTIONS: beach, amusement parks, discos, swimming pool, shuttle service, organized excursions. SERVICES FOR DISABLED: entrance with inclined ramp on the ground floor, lift for disabled people, rooms with aids and wheelchair maneuvering space, shower accessible with a chair. Even the beach is equipped to offer assistance and comfort to the disabled. PETS: allowed of all the sizes both in the hotel and on the equipped beach. BREAKFAST: sweet and savory buffet until 12.00, with a wide choice of croissants, ring-shaped cake, biscuits, yogurt, cereals, jams, Nutella®, honey, fresh fruit, dried and syrup accompanied by juice, coffee beans, cappuccino , hot and cold chocolate, non-powdered milk, tea, mixed cold cuts and various cheeses. And again, sweet and savory crêpes, eggs with bacon, boiled and soft-boiled eggs, "Nature" corner with organic and vegan products. LUNCH AND DINNER: à la carte menu with 4 first and 4 second courses, fresh fish, homemade pasta and artisanal pastry. The appetizers, hot and cold meat, fish and vegetables, are offered buffet style. VARIATIONS: vegetarian, vegan and gluten-free menus are available. In hotel: strollers, baby sitter service. 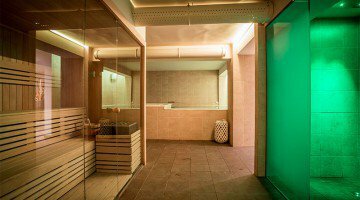 The hotel has a Spa equipped with Turkish bath, sauna, hydromassage pool, emotional showers, massages and beauty center. For sports lovers there is a Tecnogym equipped fitness center and a bicycle-equipped workshop. The wellness areas remain open from 10.00 to 20.00 and, by reservation, can be used exclusively from 9.00 to 24.00.